Accepting back up offers. Ideally situated in the sought after gated community of White Cloud Estates. This View property located on a cul-de-sac features 3 nice size bedrooms, with an upstairs den area with built in office (could be converted to a 4th bedroom). The elegant master bedroom features a large soaking tub with separate shower and dual vanity sink and balcony off the master with views. Through out the interior you will find recessed lighting, ceiling fans and custom high end plantation shutters. The Gourmet kitchen has granite counters, extended island and upgraded travertine backsplash. This open floor plan features a family room with built-ins and fireplace and a separate living room and dining area. High Cathedral ceilings make this home feel expansive. It also, includes brand new wood like laminate flooring and newer style carpet, leaded glass windows downstairs. The backyard features gorgeous stone colored concrete, a covered patio, water fountain and gorgeous views!Huge 3 car attached garage. 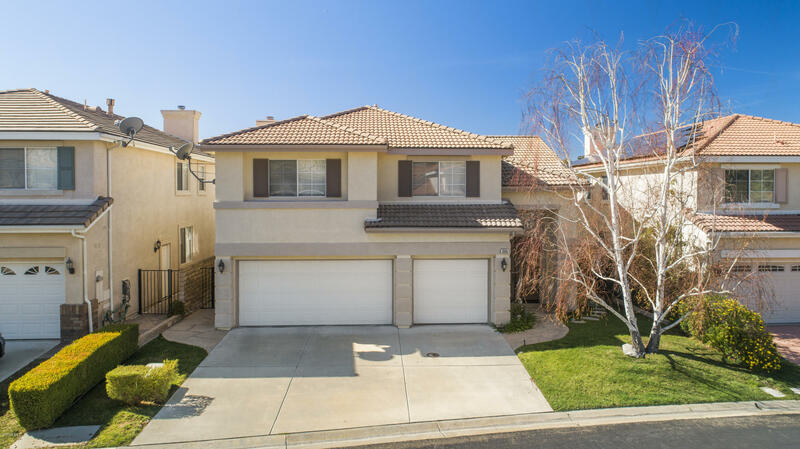 Ideally located near highly rated Simi Valley schools, minutes to Burbank airport and the San Fernando Valley but in the bedroom community of Simi Valley. And this community offers a pool too.